Google Shopping is a great platform for e-commerce businesses and as interest in e-commerce is growing so is also the demand for more online shopping ads. 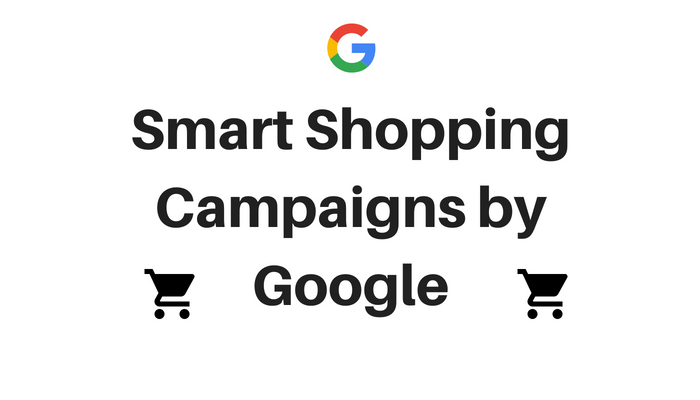 Recently Google launched Smart Shopping Campaigns which save time and expand reach for retailers’ ads. Google Shopping has been available for a long time, but it has been very complicated to manage and create campaigns. With Google’s innovations this is becoming easier and accessible for more advertisers. 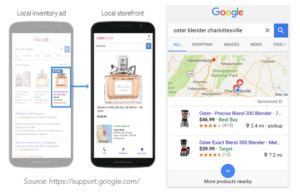 After the Google Ads Keynote last week it became clear that Google is going to roll out a few new campaign types and features for Shopping to make the set up easier. The focus is on small business owners who manage their accounts themselves as well as bigger e-commerce stores which look for simplifying their campaign management. These are product ads which appear either on top of the search results in Google or in a separate section of the search, called Shopping. The ad consists of an image of the product, a name and description and a clickable button. After clicking the user is redirected to the landing page where she can buy the product. There are also additional features like sizes, materials, colours which users can select from the ad. How does the Google Shopping auction work? The auction is similar to the Google Search auction, but instead of keywords the ads rank on the product descriptions and titles. You can have multiple keywords for search ads, but only one title and one description for Shopping ads. This makes the choice of words in the title and the description crucial to the success of the ad. To create a shopping ad, you must upload a spreadsheet file with all the information from your products in a platform called Merchant Centre. The information you upload must contain products and product categories. The cleaner and structured your categories are the easier for Google is to understand what you are selling and when to show your result. An example of a good category structure is Clothing & Accessories > Clothing > Outerwear > Coats & Jackets. The line must be logical and in the correct order. 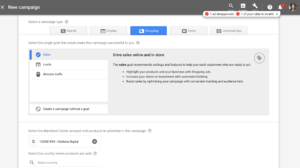 Then to create an ad you must use Google AdWords and connect your account with Merchant centre. To do this you must request from your Merchant Centre access to your Google AdWords account, then go to Settings and choose Linked Accounts. You will have to accept your request from Google Merchant Centre and you are set. To create a shopping campaign, you proceed like with any other campaign in Google AdWords, but as a type you choose Shopping. 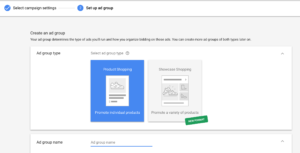 Then Google AdWords will pull out the data you have uploaded in Merchant Centre and you can create ads for the products you want from your data. In search campaign you create ad groups with different keywords, in Shopping you create product groups with different products. The product groups are based on the categories which you have uploaded. This is why it is so important to send the right structure of categories first. You can determine bids on product group level and bid manually or use automated bidding. With Shopping campaigns, you can focus on clicks or return on ad spend (Target ROAS). There is no Target CPA, as every product has a different cost and it will not make sense to optimise to a cost per acquisition(sale). With Target ROAS you target a percentage of the revenue your product brings in which you are willing to spend for advertising. What you can and cannot sell with Shopping ads? Google’s rule of “not being evil” is evident in the requirements for shopping ads. You cannot sell any dangerous products like explosives, drugs, weapons and tobacco, but also some other products like cars, magazine subscriptions and concert tickets. There are product categories which are allowed but extra scrutinized by Google. Such is alcohol, adult and sexually suggestive products and pharmaceutical. To sell these products with Shopping ads, advertisers must carefully follow the guidelines of Google for targeting the right audience and presenting the product in a safe way. Google clearly shows they are making Shopping much more prominent product on their portfolio. With new ad formats Google Shopping is going beyond search. Smart Shopping Campaigns are new type of campaigns which allow advertisers to show ads across search, YouTube, Display and Google Maps with the same campaign. Earlier last year Google rolled out Smart Display Campaigns, which are automatically targeting, bidding and creating ads from the website content or few images and text the advertiser submits. Now Smart Shopping Campaigns are taking the same concept for Shopping ads. The targeting and bidding is automated and based on the product feed data and past conversion history. To be able to run Smart Display you need minimum 20 conversions in the last 30 days and a linked to AdWords Google My Business and YouTube accounts. What’s even better is that no product feed is needed to be uploaded. Google Shopping campaigns will be able to scan the website and get automated feeds. This will be launched later in 2018. There are also good news for advertisers using Shopify online stores. In December Google made possible syncing real-time product inventory from Shopify with Merchant Center. This eliminates the need to update product feed constantly, by submitting spreadsheets when there are changes in the inventory. By the end of this month it will be possible to manage a Smart Shopping campaign directly in Shopify. This means advertisers will not have to switch back and forth between Shopify, Merchant Centre and Google AdWords. Smart Shopping campaigns come with new goals besides Maximize Clicks, Target ROAS and Maximize Conversion Value. The goals will be focused on getting new customers and increasing in-store visits. This is great for businesses which would like to sell both on and offline. 3 out of 4 users who search for a local business on Google end up walking in within 24 hours. This is very predictable behaviour and a strong indicator of buying intention. Optimizing for store visits will allow your ads to show to people doing local searches. Google’s local campaigns which were announced to roll out soon will allow advertisers to focus on users doing local searches and encourage them to come in store. The ads will also be visible on all Google’s properties — YouTube, Maps, Search and Display. These ads are more targeted to local businesses which cannot really sell a lot online — like car dealerships or restaurants. For shopping campaigns, there have been Local Inventory Ads(LIA), which are Shopping ads which give the option to buy online, but also show nearest physical locations where this product can be bought. To use these, you don’t have to set a Smart Shopping Campaign, you can simply enable Google to show your business location with your shopping ad in the campaign setting. No matter whether your goal is online or offline sales or store visits, there are great solution existing and coming up in the next months. Automation and AI driven bidding and targeting is making Shopping campaign set up much more accessible even for advertisers without prior knowledge.